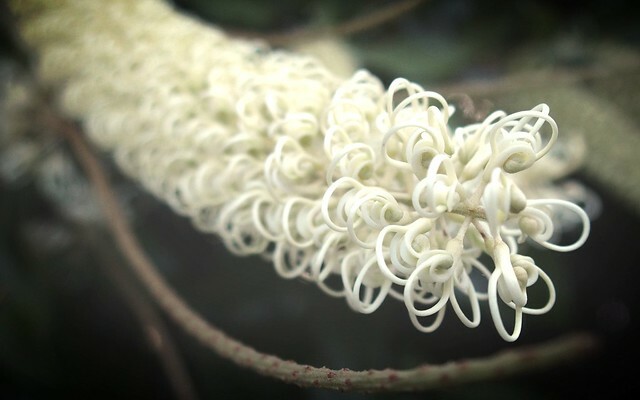 The Ivory Curl trees were in full bloom the day we drove to the mountains. Other than Milano’s on the Mall after work on a Friday, the loose scattering of odd-shaped volcanic plugs called the Glasshouse Mountains are one of my favourite places in Queensland. Driving up to the Sunshine Coast these past few weekends, Mt. Tibrogargan always catches me out. Its shape-shifting profile means that as you drive around it it’s apt to take on different appearances. The mountain was known as ‘father mountain’ to the aborigines, but I’ve only ever known it as ‘gorilla mountain’ since that’s what Tina called it the first time we drove the Steve Irwin Way (which doesn’t mean driving around saying “Crikey!” a lot, incidentally; that’s just the name of the road you take to get to the mountains from the Bruce Highway) about fifteen years ago. Mt. Coonowring (a stark, sharp-edged monolith growing out of the clinging jungle) is called ‘Crookneck’ because in the aboriginal creation story he was supposed to look after his family. He didn’t, and he got a belt with a club for his laxity. Ever since then he’s hung his head in shame. Matthew Flinders climbed Beerburrum, another of the Glasshouses, in 1799, but he already has a range named after him down in South Australia, so I’m glad they kept the word that means ‘the sound of king parrots flying’ for that particular mountain. The tents had thinned out in the campsite beside the Surf Club since we started coming up to Mooloolaba a few weeks ago. As we walked along the boardwalk between the beach and the campsite that first weekend I couldn’t believe the size of those tents. People seemed to have brought everything with them for their week or two by the beach. Apparently a lot of people book the same spot, year in year out. Dad will come up a week, sometimes two, before the rest of the family, just to set up the tent. Over the next week or so the entire contents of the house, it seems, will be transferred from wherever they live to this campsite. Unlike those campers we tend to travel light, since half the time we can only manage one night up on the Gráinne Mhaol, the boat we’re minding for our friends up here in Mooloolaba Marina. On those days we get up just in time for an evening swim, which is the best time anyway during this sort of hot and botherey weather for a swim. 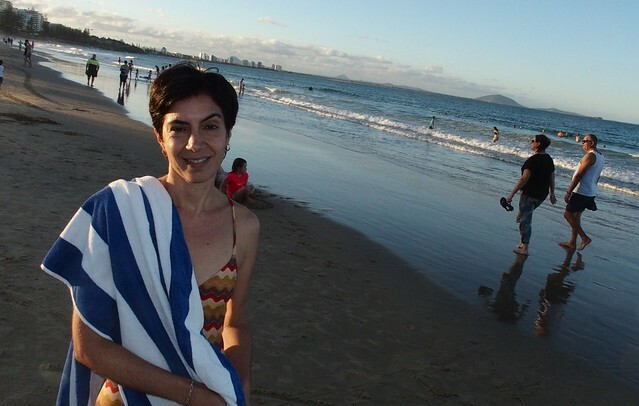 Here’s Tina (above) after our evening dip last weekend. It’s great to beat the day and manage a swim just before the sun starts to set. Mt. Coolum is in the distance, just north along the coast, and the slightly larger, more distant Mt. Cooroy is visible between it and the apartment blocks of Maroochydore. 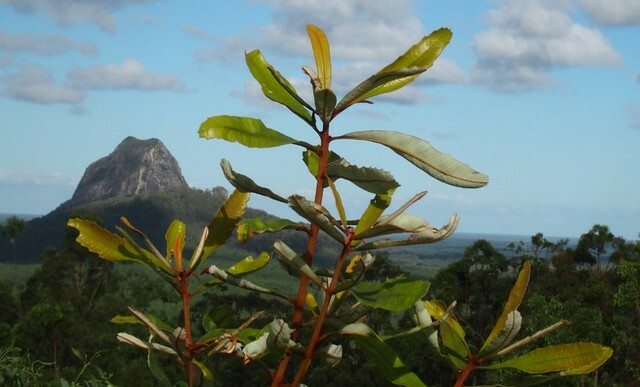 They stick out individually, not part of any range to speak of, and in echoing the nonconformism of the Glasshouse mountains in that way they become unacknowledged, far-flung members of that range.